Not being a fan of organised religion, the only times I visit a church are for weddings and funerals. And so it was recently when I visited the Roman Catholic Cathedral of St Stephen in the CBD for the funeral of a friend. Not a close friend in recent years, but in our youth we worked in the same place and were further connected by escapades involving cricket and football, not to mention women and beer. He died far too young, taken by cancer, leaving behind a wife, children and grandchildren. It was sad and beautiful at the same time, in the way that funerals are. Many of our contemporaries were there, all of us being reminded of our own mortality, but remembering the fun times we had shared in earlier days. After the service, and after the hearse had rolled away, we had a cup of tea in a room next to the cathedral, while photos of our friend - the family's husband, father and grandfather - appeared on the wall to remind us of what a good man he was, and how fleeting life is. 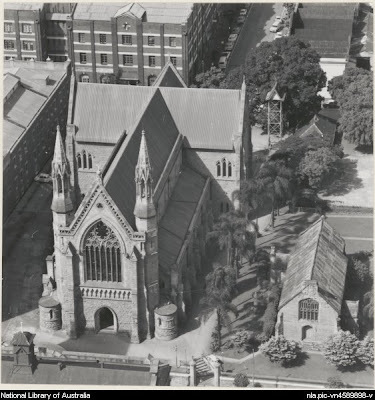 This web-page at the Catholic Archdiocese of Brisbane's site informs us of the history of the Cathedral of St Stephen. The foundation stone of the original church on this site was laid in 1848, and then the church was opened in 1850. It became a cathedral in 1859 on the appointment of James Quinn as the first Bishop of Brisbane. This original cathedral is shown in the photo above, taken in 1928. My recent photo, below, shows how they look today - click on it for a larger version. 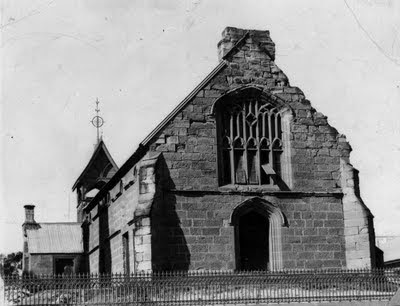 Archbishop James Duhig had plans for a new cathedral in Fortitude Valley, but the plans were abandoned during the recessionary 1920s. St Stephen's has remained the Catholic cathedral, and several refurbishments have taken place over the years, the latest being about twenty years ago. The stained glass windows, several of them bequests of the family of pioneer local alderman and businessman Patrick Mayne, are an amazing feature of this inner-city place of contemplation and worship. Hi, do you know the name of the artist that crafted the statue of St. Mary McKillop (from one bark of a tree) at the original chapel? "Brisbane sculptor, John Elliott, began with the trunk of a hundred-year-old camphor laurel tree. He sliced it and hollowed it out and then began painstakingly to recombine its elements, allowing the figure of Mary MacKillop to emerge. The ancient tree and its rough bark recall the slab hut in which she opened her first school, and the old fence posts she passed as she travelled through the Australian bush on horseback."